Many actors are deeply committed to NOT succeeding. “What?! But I work really hard” might be a common response to that concept. But I find the concept to be quite true. A staggeringly large portion of the actor population seems quite shocked that Hollywood has not “discovered” them yet, but a large amount of their days are spent at home doing unproductive activities or at a day job that cannot advance their career (even financially in many cases). Many truly believe that they should be given large sums of money, fame, and artistic rewards just because they desire it. But when you ask those same actors what they are doing on a daily/weekly basis for their careers, the usual answers look something like… “I submit, I take acting classes, I got new headshots, and my agent is submitting me. These are all fine and good….and even recommended. But those small tasks added up do not usually equal a career worthy of fame, fortune, and artistic fulfillment. It usually takes much much more. I would like to suggest the idea that an actor’s career is a direct reflection of how far they are willing to be uncomfortable. 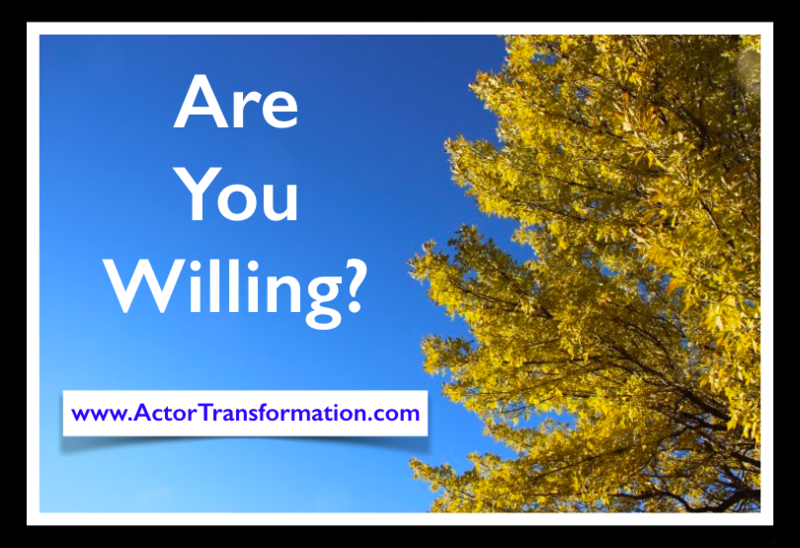 How far the actor is willing to stretch and grow. How far the actor is willing to get WAY out of their comfort zone. For many actors, struggling and waiting tables is relatively comfortable – But working 6-10 hour days on an acting career AFTER coming home from the survival job is not. For many, staying in the same acting class for 2 years feels alright. But learning how to compete on a star level is not something they are willing to commit to. And many actors are absolutely willing to spend lots of time, money, and energy on getting representation, but are not at all willing to nurture the relationship once they have it. And even more important … very few are willing to learn what it takes to promote and represent themselves! The moral of this particular story could be that if you really want a BIG career, then you must be willing and able to put in the work that the big career requires. Are you willing to work every day on your dreams? Even when you don’t want to? Are you willing to look at the “No’s” you receive as one step closer to a yes? Are you willing to learn what you don’t already know? … And maybe even RE learn what you think you already DO know/ Are you willing to be flexible in your approach? Are you willing to laugh at how ridiculous the industry can be at times instead of taking in personally? Are you willing to be scared … and still do it anyways? Are you willing to never give up? If you honestly answered YES to all of the above, and are really going to follow up… then you are in a small group … but good company. You just might have a shot at this whole crazy acting thing! Should be a really fun ride!